Thursday's polling data brought forth a handful of surveys that were in the field following the town hall presidential debate in Hempstead. Overall, though, the evidence thus far is that we are still in a wait and see mode in terms of the impact the second debate -- if any -- had on the direction of the 2012 general election. As we have alluded to here in the past, the polls in the time before the first debate had already started to take a slight turn toward Mitt Romney; a turn that was exacerbated by that debate. There are a couple of ways of looking at that and what happened (or will happen) next. One view is that the first debate turned things off and that the vice presidential (and perhaps now the second presidential) debate slowed that trend down and triggered the leveling off that we have seen. The opposing view is that the first debate merely sped up something that was underway already: a return to the fundamentals of the race. In other words, the race was bound to return to the Holbrookian equilibrium of the race where the president -- based on the economy and presidential approval (among other factors) -- held a small advantage in the race. That has been borne out in the polls. The race has narrowed, but the president continues to hold small but consistent leads in enough states to reach 270 electoral votes. Have some states slipped away? Yes and no. North Carolina has been consistently in Mitt Romney's column all along, and seems to be close but realistically off the table now. Florida, Colorado and Virginia, too, have moved toward Romney and in a way that tips slightly toward the governor, but are still competitive. And that movement toward Romney is true in other states as well, but not to the same extent. Those states (Ohio, Iowa and New Hampshire among them) are similar to the three above, but (slightly) favor the president. All told, there were 13 new polls from 10 states on Thursday. Since the last PPP survey of the Centennial state in late September, Romney has gained a couple of points and Obama has lost one. Compared to the FHQ averages, this survey overstates Obama's share some, and is within range of the Romney share. There may be a single digit lead in one of these surveys, but the picture is still clear in the Nutmeg state. It is blue and is out of reach to Romney given the information to which we have access. At this late stage of the race, any poll that shows a margin outside of about 4-5 points of the FHQ weighted average margin in a given state is probably an outlier. The Marist survey out of Iowa this evening seems to fit that bill at Obama +8. The president may have the advantage there, but it likely is not in the upper single digits. The two polls released today hover nicely around the FHQ weighted average; one on the low side and one on the high side. The Great Lakes state seems to be out of range for Romney in the same way that North Carolina is out of reach for the president. Achievable if something very uncharacteristic occurs, but realistically off the table. Minnesota has slipped into and settled at a spot just under the Strong/Lean line on the Obama side of the partisan line. The Survey USA poll today did little to change that. In fact, the numbers matched the firm's last -- early September -- survey in the Land of 10,000 Lakes. The lead seems to have stretched for Romney some in the Tarheel state, but perhaps not to the level reflected in this Rasmussen poll. Romney is up one and Obama down two since the pollster's previous survey conducted in North Carolina. The Romney +3 in the earlier poll seems about right. The key in Ohio moving forward is not the size of the lead -- it's close and will continue to be -- but who is ahead. And Obama continues to lead Romney in surveys of the Buckeye state. Today's two polls seemingly set a pretty accurate range: 1-3 points with an occasional Romney lead of +1 thrown in for good measure. See Ohio, but in reverse. Romney is the one with post-debate leads in the 1-3 point range with Obama contributing a +1 margin in the Old Dominion here and there. 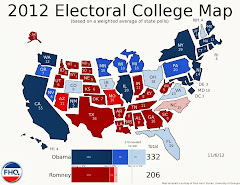 Another single digit lead for the president, but one that does not bring the Evergreen state into range for Romney. 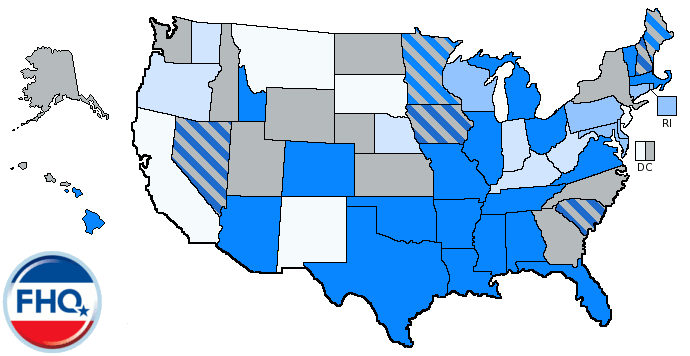 Washington is part of a group that includes Connecticut above as well as New Jersey and New Mexico; states clustering around the Strong/Lean Obama line. See Iowa, but perhaps not to as great an extent. This poll is within range of the FHQ weighted average -- a little high nonetheless -- and is not like the Marist poll of Iowa; nearly five points out. This one doesn't fit with the other post-debate polling in the Badger state though. 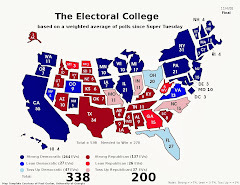 Both the map and the Electoral College Spectrum remain unchanged today. 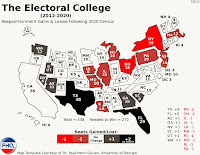 Increasingly the race is about the president's ability to keep things close in Virginia, Colorado and Florida and the Romney campaign's ability to do likewise in the Wisconsin-Iowa group of states below. Shifting to the Watch List, things are only slightly different than yesterday. On the strength of the outlier from Marist, Iowa is now back on the list; within a fraction of a point of moving into the Lean Obama category.